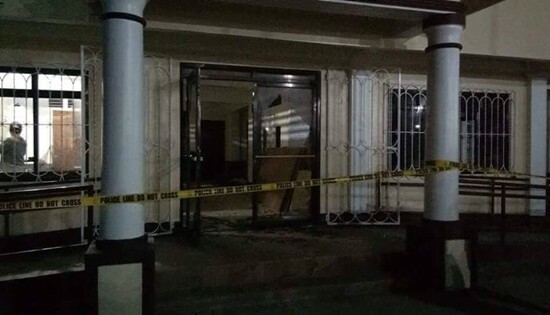 CAMP LUKBAN, Catbalogan City – The Municipal Police Station (MPS) of Lapinig, Northern Samar manned by six PNP personnel under PCI Noly Montibon, Chief of Police was raided by undetermined number CPP-NPA Terrorists (CNTs) onboard two dump trucks and one jeep at around 2:00 A.M. on August 10, 2018. The firefight lasted for about 15 minutes that resulted in the wounding of PO1 Edison Aguerre and PO2 Jerry Quilicol. The CNTs carted away the following items: 10 assorted high powered firearms, three handguns, undetermined numbers of ammunition/magazine, undetermined numbers of MPS desktop/laptops, and the MPS hotline cellular phone. It can be recalled that on July 13, 2018, Marieta “Tayang” Bartolo, Front Secretary of Metro 1, SRC Emporium an NPA unit operating in the municipalities of Pambujan, San Roque, Silvino Lobos, Las Navas, Mondragon, and Catarman all of Northern Samar and Ruth Martirez Figueroa, Bayan Muna President-Northern Samar, an incumbent Barangay Chairwoman of UEP, Zone 3, Catarman, N.Samar and three others were apprehended at a checkpoint. The Lapinig raid coincided with today’s scheduled arraignment of “Tayang” who has two warrants of arrest issued by the Gamay Regional Trial Court. Maj. Gen. Raul M. Farnacio, Commander 8ID condemns the pre-dawn attack conducted by these CNTs as a terrorist act against the people of Lapinig, N. Samar.